President Barack Obama and first lady Michelle Obama could stroll around the White House in matching Dior bathrobes and Brazilian soccer jerseys before he grabs his $7,750 golf bag or goes for a ride on his bamboo bicycle while listening to his new 2GB iPod shuffle – all courtesy of the bewildering array of gifts that world leaders showered on the first couple in 2011. The list also includes shirts, pens, sculptures, quite a few rugs (way to think outside the box, Afghan leaders! ), the occasional flavored liquor, a deluxe package of items linked to the Polish-made video-game "Witcher 2: Assassins of Kings" and one small sword. The State Department’s office of the chief of protocol on Friday released the list of presents American government officials received from foreign government officials. Not to worry: The Obamas won’t be keeping the $52,695 gift from Ali Bongo Ondimba, president of the Gabonese Republic. Like most of the items bestowed on the first couple, Ondimba's gift—a “14″ blue mask sculpture by Daum, on a 10″ black and silver stand, enclosed in 34″ x 16″ x 13″ red box” is at the National Archives. The U.S. requires all such gifts to be reported and turned over to the archives or other institutions for display. These are not, in short, bribes. From the list, it appears that the only thing Obama "personally retained" from his 2011 haul is the book “Genghis Khan and the Making of the Modern World,” by Jack Weatherford. The president received that work, which retails for $23.95 on Amazon, from his Mongolian counterpart, Tsakhiagiin Elbegdorj. Next to each item is an entry entitled "circumstances justifying acceptance." For gifts to the Obamas, it reads: "Non-acceptance would cause embarrassment to donor and U.S. government." Gifts to the first family totaled $243,970.96. Of that, items for the president himself totaled $194,125.33; those to the first couple ran $21,438.78; those to the first lady were $22,343.59; and those to daughters Malia and Sasha, $6,063.26. DVD, title: “Best of the Witcher 2: Video Trailers for President Barack Obama,” distributor: Atari. Zubrowka Bison Grass Vodka. Book, title: “Blood of Elves,” by Andrzej Sapkowski. Book, title: “The Last Wish,” by Andrzej Sapkowski. Set of four 2″ x 1.5″ clear glass liqueur glasses, each has “Zubrowka” engraved in white. 13.5″ x 9.75″ x 4.5″ “Witcher 2” gift box, inside are three golden “Witcher 2” coins, a “Witcher 2” book, “Witcher 2” stickers, “Witcher 2” make your own aircraft. 5.5″ x 6.5″ x 3″ ivory-colored bust of “Witcher 2” character “Gwynbleioo,” a DVD box set of “Witcher 2” bonus DVD, Game DVD, and Game Guide. “Witcher 2” playing cards, and 5 wooden die in black sack with “Witcher 2” emblem. 11.75″ x 7″ x 5″ brown leather carrying case with handles and lock. Rec'd—5/28/2011. Est. Value—$497.08. Then-French President Nicolas Sarkozy and French first lady Carla Bruni-Sarkozy gave Obama the "large, black Hermes golf accessory bag, including set of lock and key, and extra strap in bottom compartment" valued at $7,750—but didn't stop there. Non, monsieur. On other occasions, "Sarko" and his wife presented Obama with a "Lacoste white classic men's polo shirt," a fountain pen, "six black glass goblets in a plastic display case" and a 14"-tall "blue-gray glass sculpture of Bucephalus, Alexander the Great's horse." And in August 2011, with Washington consumed by the debt-ceiling crisis, the Sarkozys again played to Obama's fondness for golf, giving him a "Crystal golf statuette by Baccarat, depicting a golfer with his iron pitched over his head in the moment before striking a ball. Black Hermes golf travel bag with canvas cover and carrying strap," all for an estimated value of $1,650. Were they done? Nope. In December 2011, they gave Obama a Louis Vuitton "men's business bag" embossed with "B.O." That was valued at $2,310. 17″ tall Plexiglas sculpture, entitled “Wrapping Flag Candy USA,” depicting an upright “Tootsie Roll” with an American flag patterned wrapper, on a 6″ x 6.75″ x 0.75″ clear Plexiglass base, accompanied by a certificate of authenticity. 11″ x 14.5″ x 7″ Korean, black lacquer jewelry box with mother of pearl inlay that depicts landscapes and birds, and has bureau-style doors with turtle-shaped doorknobs on the front and a drawer below, with an inner compartment that has three smaller drawers on the left and a section for hanging necklaces on the right. Note to members of Congress: If Obama gives you a 9.5” by 12” signed and framed photo of Denmark’s queen and its prince, he’s regifting. The Philippines ambassador and his wife gave Obama the bamboo bicycle ($1,060). 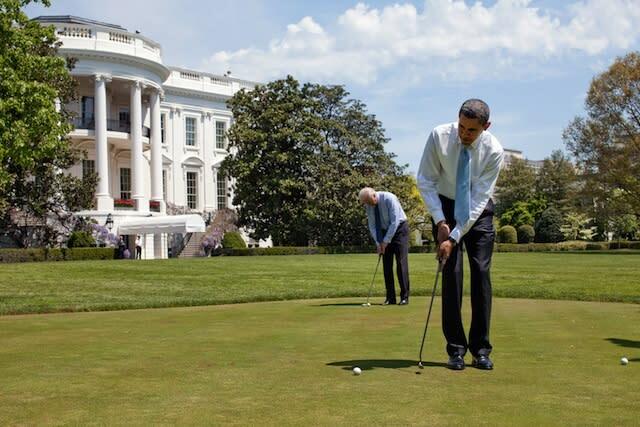 German Chancellor Angela Merkel also thought “golf!” She gave Obama a $1,400 care package comprising a “Kramski putter set, includes: 35″ HPP 340 putter with two protective club head covers, teal HPT 40 training console, HPS 30 Aim Aid set, book title: 'The Kramski Putt Philosophy.'" Canadian Prime Minister Stephen Harper seems to have been the only one to zero in on Obama’s other sports passion: basketball. Harper gave Obama a basketball signed by the 2010-2011 Toronto Raptors. The list also includes items to Vice President Joe Biden and other officials. Three Senate Democrats, Jon Tester of Montana, Jack Reed of Rhode Island and Carl Levin of Michigan, each received silver Janbiyas from Dr. Rashad Mohamed Al-Alimi, the deputy prime minister for security forces of the Republic of Yemen. 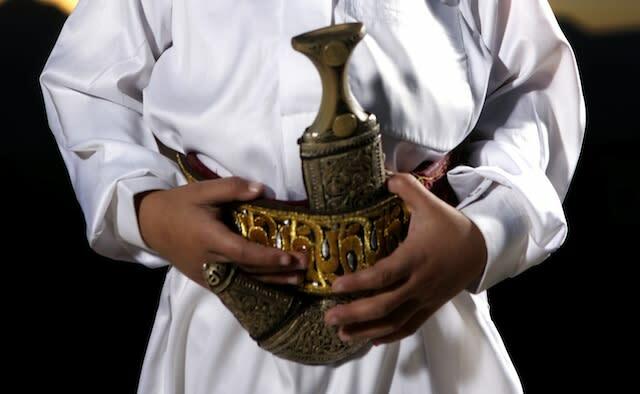 Janbiyas are thick, ornate knives that curve at the blade commonly worn at the belt. Chris Moody contributed to this report.